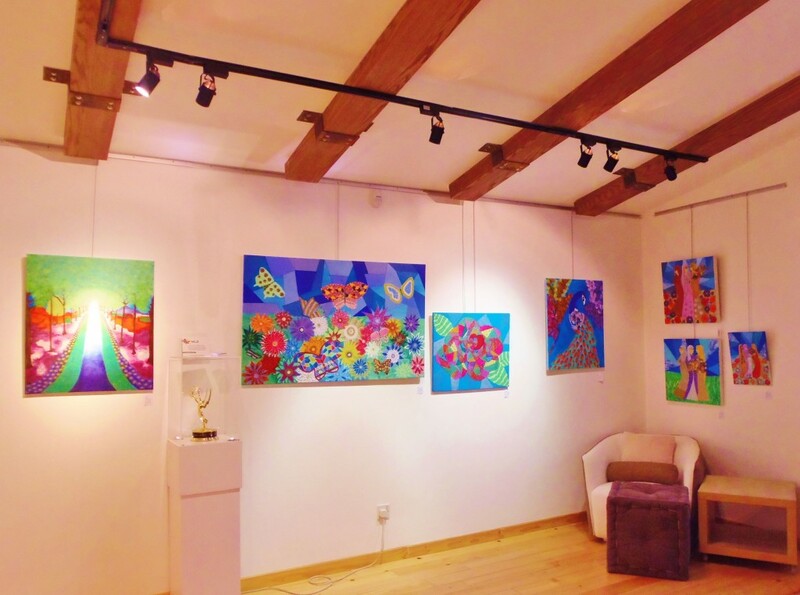 This month we would like to shine the spotlight on the talented artist Wilma Burton. Originally from Venezuela, Wilma arrived in the UAE 3 years ago from Los Angeles, California. 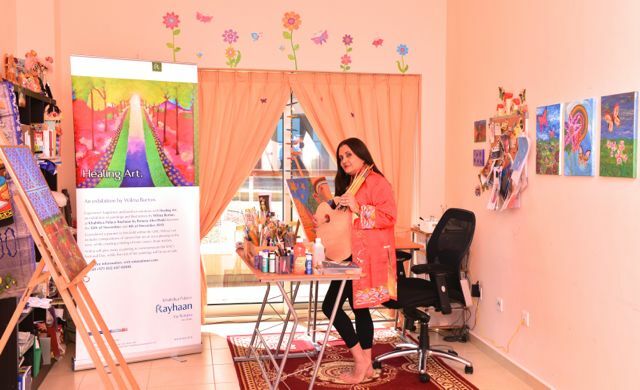 In that time, we have seen her work popping up in various places but most recently at Etihad Modern Gallery where she is the Resident Artist. She is an Emmy Award winning TV producer, and now we have the privilege of watching her success grow within the Abu Dhabi art scene. Her effervescent personality will draw you in, as will her colourful Healing Art. When she is not painting a new creation, you’ll find Wilma making a difference with her non profit work. We love inspiring women who follow their hearts and dreams. My greatest professional achievement was winning an Emmy Award from the Academy of Television for a production I did for the city of Los Angeles. I always said not too bad for a girl who grew up in a cotton farm, in the rainforest, on the plains areas of Venezuela. I am very active with the social media in big part because of my art using Facebook and LinkedIn. People tend to tell me I would have made a good psychologist instead of television producer and artist. I think it is my personality that allows people to be themselves when I am around and they trust me. In a way, I am like an advisor for my friends. Even my own doctors feel comfortable sharing with me their issues, and then asking for advice. I really try to balance my life and work even though it can be hard especially when inspiration strikes and I am in the studio. I try to spend time with my girlfriends, volunteer work, which I find very rewarding, go to movies, art galleries, and travelling. I visit Facebook everyday to check my Healing Art page, and another page I created called Abu Dhabi Missing Pets dedicated to help people in the city find and report any missing pets. My hero is Mother Theresa. I used to volunteer my time in one of her charities in Los Angeles, and she knew about me which I found amazing. The greatest gift I ever received was from her, a beautiful cross she sent me with one of her missionaries. She influenced by life in many ways. I have learned to be humble, live with less material things, be more kind and share what I have with others. There is so much I have learned from her I can write a book! Overall I have learned to be the best human being I can be. My favorite people in this country are, of course, my husband, a very kind man with a big heart. My internist, Dr. Shaista who is a woman with so much wisdom. My third favorite would be a group, any group – where people take time to make a difference in this country by helping others. Fortunately, I am lucky to know quite a few. 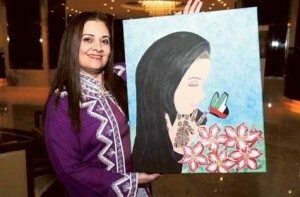 Do you have any advice for artists in Abu Dhabi? My advice for any artist is to be prepared for what being an artist involves. Be prepare to handle rejections and don’t allow any negativity interfere with goals and dreams. Never give up and have passion for your craft. How did you get started here in the UAE? I started in the UAE after moving here from Los Angeles. Starting over in a new place was difficult, but I am a positive person and hard working woman. I created a home studio, started to paint again, reach out to people for help. I made new contacts in the field and basically knocking door to door until I found opportunities to exhibit my art. What challenges have you had to overcome and how? Some of my challenges at the beginning were finding more about the art scene in the UAE, where to buy materials, where to find resources to help me with my art, visiting galleries. It was tough starting over in Abu Dhabi. I became active in networking and took every opportunity that came my way. I became active with the social media, created my website and a Facebook page. I began to market myself and educate others about what Healing Art is and what it means. Since the art scene is relatively new in the UAE, I worked day and night for months. Those efforts paid off as people noticed more and more my art. I am blessed I have a lot of support from the local media. I had a breakthrough when a gallery curator was impressed with my portfolio giving me the opportunity to become a resident artist at Etihad Modern Art Gallery. 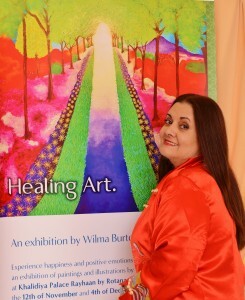 I can not imagine ending up in a better place to exhibit my Healing Art. I am very grateful to the gallery chairman and founder, Mr. Khalid Seddiq and the CEO, Mr. Shahdad Jahanbani. I would continue to do what I try to do now as far a community service. Do as much good as possible, but on a bigger scale – helping anyone in need anywhere in the world. How do you define Healing Art? Healing Art is a type of art that promotes healing and well-being whether it is physical, mental and emotional. This happens by changing a person’s physiology and attitude. By using healing art, people can benefit from a painting by experiencing positive emotions such as hope, peace, happiness, and harmony. In hospitals and healthcare facilities, Healing Art has been used to ease the mind of those who find hospital settings stressful. In all sorts of unexpected ways, art in hospitals has significantly proven beneficial by research conducted by experts in the field. For example, patients who are surrounded by this kind of art have shorter hospital stays. It can also decrease the need for pain relief, lower blood pressure and improve the immune system. What is the process of creating healing art? Healing Art has to be the right art, vivid paintings with compositions that the mind associates with goodness with images of landscapes, friendly faces, and familiar objects while abstract paintings can have the opposite effect. In my work I use a lot of images of nature since nature is universal and appealing to most people. I think most of us love flowers, rainbows, the ocean, etc. Colors also play a big role in the creation of Healing Art, each color has a different healing property. It is a powerful communications tool and is not only used by artists, but also interior designers. Some colors are beneficial and some can produce negative emotions. For instance, I use in some of my paintings blue and green, two colors with calming effect, red energizes helping with blood circulation, and pink heals grief and sadness. Besides using colors and the right composition to create that special healing effect in my art, I try to make my art with a sensation of being pulled into it, whether is a landscape where ones imagination can run free or a serene place where there is peace and quiet. Do you have people who visit you and you heal them through art? 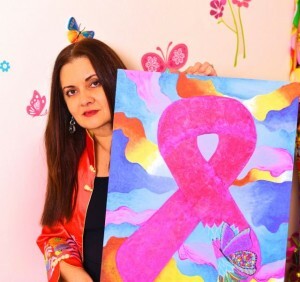 Yes, some people who visit my studio, suffer from stress, anxiety or depression, so according to each particular case I create a painting to produce or transmit the healing effect they need to improve addressing a specific condition. An interesting fact worth mentioning, is that some of my collectors hang my artwork in their bedrooms, because they told me, “It is the first thing they want to see when they wake up, and the last thing they want to see when they go to bed.” I interpret my art like a having a window to nature that makes us happy. Why is the medium of art good for healing the soul? Art for the soul is special. I incorporate images that have spiritual significance such as hummingbirds. These birds are a symbol of resurrection, a creature that opens the heart and teaches people to enjoy the magic of being alive. Butterflies are a symbol of transformation and faith, helping us undergo transitions and new beginning. Peacocks which are a symbol of renewal, and the peacock feathers have been used for thousands of years for healing purposes in many cultures, carrying spiritual healing energy that can help people searching for balance and harmony in their lives. Along with the composition, color once again plays a big role when it comes to healing the soul. For example, purple is a color of transformation and brings spiritual insights and renewal.